Today we are delving into the world of wine shimmers and deep burgundys. First up the wine shimmers. This is Essie Decadent Diva, Nails Inc Crown Court, Illamasqua Baptiste and Julep Trina. First up-please excuse the mess-didn't notice until after I took the pictures! As you can see, these are mostly all different. Diva has more brown, Baptiste is more purple. 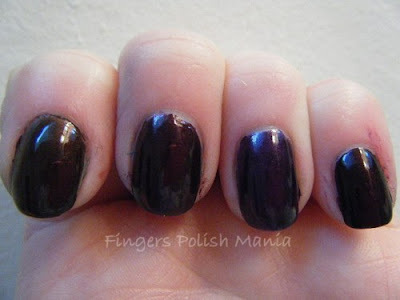 The Nails Inc and Julep are almost the same. Next up is the deep burgundys. Here is the bottle shot. 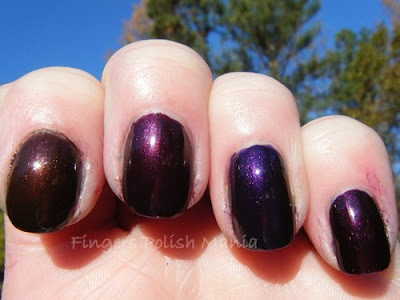 This is Essie Material Girl, Orly Naughty or Nice, Orly Naughty and Deborah Lippmann Dark side of the Moon. For me, I think 1 and 3 are the same and 2 and 4 are the same. WooHoo-that's the end of Part 5! We're in the home stretch! Hope you are enjoying these! Am wondering if you would like me to go to a 2 column blog so I can make my pictures even bigger-any thoughts out there?